Standing on top of a recently-formed island, after Prague's 1784 flood, Žofín Palace is somewhat of a romantic place. The area changed ownership a number of times, but in 1834, Václav Novotný bought the island assuring that he would turn it into a social and cultural centre for the city. The project included a restaurant, baths and a residential building. On September 27th 1840, Archduke Franz Karl visited the island, and it became known as the Island of Sofia (Žofín), in honour of Franz Karl's wife, mother of Emperor Franz Joseph I. In 1884, the existing building was transformed into a neo-Renaissance palace, destined to the most varied events. And it still holds true today. Since 1994 it is managed by Agentura NKL Žofín. Žofín holds the most varied events, from international congresses, to concerts, corporate events or weddings. There are four halls available. The largest, and also the most impressive, can host up to 800 people. It is an absolutely stunning room, amazing whoever visits it. 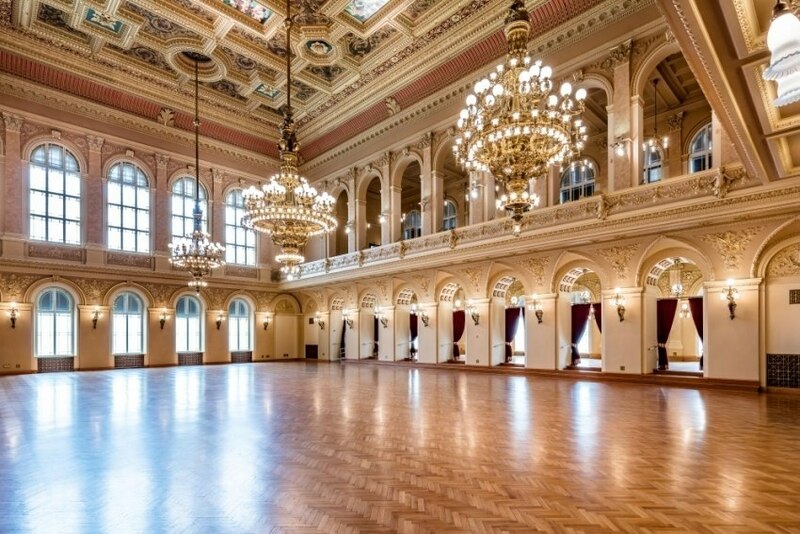 It is one of the historic buildings available for events in Prague, with an atmosphere reminiscent of a Viennese ballroom. The building, owned by the Ministry of Culture, was also associated to efforts to promote Czech culture and language, at a time when the country was occupied by the Austrian empire. The Majakovsky Room, which honours the Russian novelist Vladimir Majakovsky, is the most spectacular and imposing, a true work of art. Its capacity is for 670 people in theatre and 700 in cocktail. The Rais Room, a renowned name of Czech prose, was originally a theatre, and today it can accommodate 320 people in a theatre setting and 350 in cocktail parties. The smaller room, or socialising room, was an old conservatory, meanwhile rehabilitated to fulfill venue functions. It hosts 250 people in cocktail. In addition to these three noble rooms, the National House of Vinohrady has five meeting rooms. Everything is run by an outside company, Nardum. As a curiosity, every week since 1959 the venue hosts sessions of ballroom dancing, already iconic in Prague.